Successfully Added Touchscreen Dual SIM Dual Band GSM Cellphone + MSN and DVB-T to your Shopping Cart. 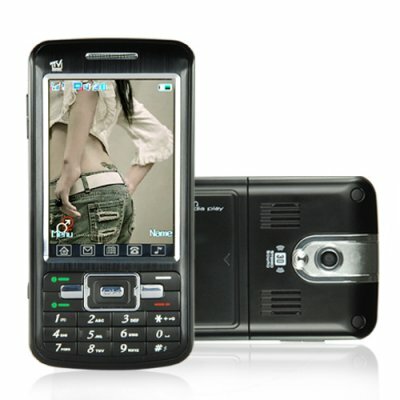 Touchscreen Dual SIM Dual Band GSM Cellphone + MSN and DVB-T. Enjoy DVB-T digital TV and MSN chatting right on your cellphone! Have your ever wanted to watch digital TV on your mobile phone? Well the dream of watching TV on your cell phone is now reality! This phone plays crystal clear digital TV in the DVB-T format used widely in Europe, Africa and China. Enjoy full-screen football, news, and your favorite shows in high definition, all in the palm of your hand. This phone is also a powerful communication device one step ahead of the competition. With pre- installed MSN messenger, so you can keep chatting even when you're away from your computer. It also has robust text and media messaging (SMS and MMS) via the touch screen interface or keypad. In addition, the dual SIM card slots with dual standby let you enjoy having two phone numbers on one phone. And its Bluetooth functionality gives you the convenience of handsfree calling. When you're not watching digital TV or chatting on MSN, you can capture pictures and videos with the built-in digital camera. Enjoy all your favorite multimedia files with the music and video player. You can even tune in to FM radio! Cutting edge technology and factory direct pricing make this phone guaranteed to sell quickly! Buy one today and be the first of your friends to have digital TV on your phone. Then order in bulk for your store or online shop. Brought to you by the leader in high-quality, low-price gadgets, Chinavasion. NOTES: (1) This product is compatible with GSM at the two frequencies of 900MHz, 1800MHz. It will not work in the United States, Canada, Mexico. (2) The second SIM card slot will not register properly with your carrier if you live in Ireland, Sweden or the Netherlands. Both SIM card slots will work fine in all other countries. But if you live in these two particular regions we suggest you choose another mobile phone model with dual SIM card slots. No, USA digital frequencies are broadcast in the ATSC format and not DVB-T. And the Phone is Dual Band, so it will not work in the USA. DVB-T is available in many countries. Check to make sure you can use this in your country here. No. No subscription is required to enjoy digital TV on this phone. The phone comes with the languages listed above. If you need any other language and plan to order a large quantity (25+ pieces) then we may be able to supply this model with your choice of language(s). Yes, the call and receive functions of this Dual Band phone work in Spain and Portugal. For the DVB-T Digital TV function, Portugal currently has an experimental Digital TV service using MPEG-4 while Spain provides a full Digital TV broadcast service. Does this mobile phone come with wi fi (wireless internet connection)? Great phone, the phone works well and i get good tv reception picking up most of our 16 Channels. Make sure you extend the aeriel fully if you want to watch the tv, this noticably improves your reception. The duel sim works well and has an easy to use touchscreen. Chinavision is great for quick delivery and fantastic service i highly recomend purchasing from them, for an internet company they are awsome. Most impressed with the 'phone. It does all that is claimed and it is easy to operate. I recommend it. light long lasting battery very useful!!!!!!!!!! Just received my phone and it works great and light despite its size. Image quality great though in my part of the world TV reception leaves a lot to be desired but has wonderfull reception outdoors (19 channels)even on the move. Sound volume is amazing, quality is very good. Brings everything you might need although it could have brought a cover for it as itsd a litle big for the trouser pocket. All in all a good buy.